How much interest can you save if you refinance your mortgage? This Mortgage Refinance Calculator helps you find out! Enter the specifics about your current mortgage, along with your approximate property value, new loan term, mortgage rate and closing costs. 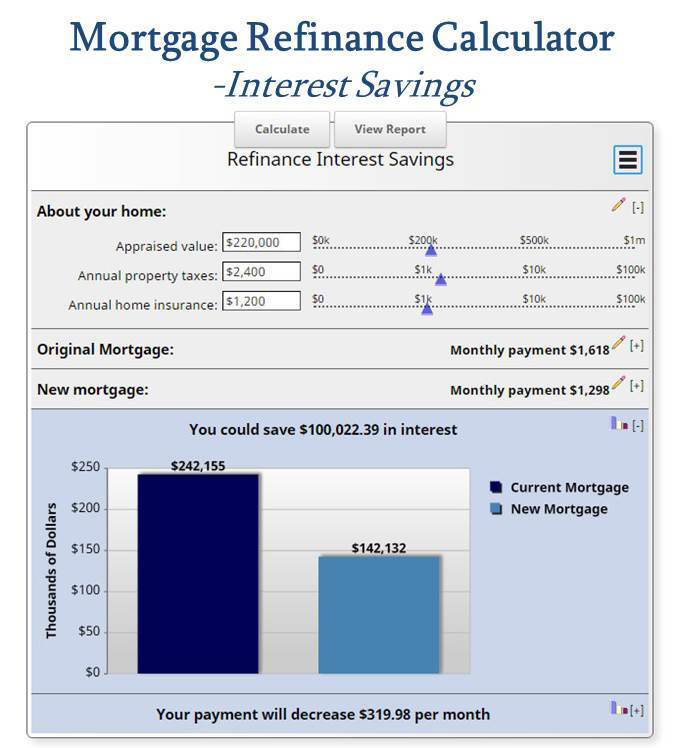 This Mortgage Refinance Calculator will determine how much interest refinancing can save you. In addition, it will calculate the number of months to break-even on closing costs with your reduced monthly payment. Click the "View Report" button to see the number of months it will take to break-even. Use this Mortgage Refinance Calculator to help sort through confusion. Determine if refinancing your mortgage is a sound financial decision. Click on the "View Report" button for the detailed break-even analysis. This mortgage refinance calculator also includes an amortization schedule. Looking for a different mortgage calculator? More Mortgage Calculators may be found here. You can email the results by clicking on the three-line icon in the upper right hand corner of the mortgage calculator. Feel free to use current Mortgage Rates in this mortgage calculator.